To analyze the outcomes of a new technique (corneal remodeling) to treat corneal ectasia. Sixty-nine cases that underwent corneal remodeling were analyzed. Anesthetic drops were instilled and a femtosecond laser platform was used to perform an 8-mm diameter keratectomy (180°, 270°, or 360°). Once ablation was completed, the edges of the resection were sutured with 8 to 12 interrupted stitches. Three-year follow-up data are presented. The age of the population was 30.83 ± 12.65 years (range: 16 to 48 years). At 36 months postoperatively, 57.2% presented with uncorrected distance visual acuity (UDVA) of 20/100 or worse and 42.8% achieved between 20/80 and 20/40. After performing photorefractive keratectomy in 3 cases, 14.3% presented with UDVA of 20/100 or worse, 57.2% achieved between 20/80 and 20/40, and 28.5% achieved 20/30 or better in 180° arc length keratectomy. Most parameters compared were moderately to statistically significant (P < .05 to < .0000001). Corneal remodeling is a safe technique that produces corneal flattening, reduction of anterior chamber depth, and decreased optical aberrations. It also offers a possibility to perform complementary refractive procedures. Corneal reshaping techniques based on wedge re-section and suture traction have been reported with irregular results.18 The concept of the corneal remodeling technique is to reshape the structure of the cornea by flattening the radii of curvature by performing semi-lunar or annular keratectomies that are not wedge resection in relation to corneal stage. Corneal remodeling consists of reducing corneal aberrations without increasing the corneal thickness and generating a large optical zone. We previously described this novel technique and presented the initial results of 69 cases.19 In the current study, we present a long-term follow-up analysis of the same group. Preoperative examinations included uncorrected distance visual acuity (UDVA) and CDVA using a Snellen chart, manifest spherical and cycloplegic refractions, slit-lamp biomicroscopic and funduscopic examinations, intraocular pressure (non-contact tonometer), corneal tomography (Sirius, CSO, Florence, Italy; and Galilei, Ziemer Ophthalmology Co., Port, Switzerland), central corneal thickness (Ziemer Ophthalmology Co.), horizontal corneal diameter and white-to-white distance (Ziemer Ophthalmology Co.), anterior chamber depth (measured from corneal endothelium to anterior lens by the Galilei device), and corneal endothelial cell density (non-contact specular microscopy, SP-2000P; Topcon, Tokyo, Japan). Inclusion criteria for this study were patients with keratoconus grades II, III, IV, and Plus, corneal transparency, and endothelial cell density of greater than 2,000 cells/mm2. Patients were also required to have a reasonable expectation of surgical outcomes and no cataract, glaucoma, or systemic disease. Procedures were performed under topical anesthesia using proparacaine hydrochloride 5 mg (Alcaine; Alcon Laboratories, Inc., Fort Worth, TX). After placing the speculum (Moria, Antony, France), keratectomy was performed using software designed for the femtosecond laser (Z8; Ziemer Ophthalmology Co.) and arc lengths of 180°, 270°, or 360°. We performed a channel of vertical walls with different widths between the upper and lower parts, with a greater width in the inferior quadrant that decreased progressively according to the degree of keratoconus. The length of resection depended on the degree of keratoconus: the greater the keratoconus is, the greater the length and width of resection are. Figures 1A–1B show a 270° arc length keratectomy. The width could be 300, 400, or 500 µm for keratoconus grades III, IV, and Plus (RETICS classification), respectively. The resection should be wider at the base of the cone. (A) A 270° keratectomy performed by femtosecond laser. (B) A piece of 270° arc length keratectomy taken off the cornea. (C) Edges are sutured by interrupted stitches. (D) Immediately after the procedure with all stitches placed. The edges of the removed area were closed by 10-0 interrupted nylon sutures placed approximately 25° apart (Figure 1C). Sutures were passed at 90% depth of the crescentic trench, and the suture tension was adjusted by using double slip knots. The slip knots were locked down with overlying square knots (Figure 1D). The loose ends were trimmed with a sharp blade and the suture was then rotated to bury the knot in the suture track. A bandage lens was inserted at the end of the procedure for the patient's comfort. Postoperative prophylaxis with moxifloxacin and dexamethasone three times a day for 1 week and prednisolone twice a day for 1 month was administered. The postoperative examinations were performed at 1 day, 1 week, and 3, 6, 12, 24, and 36 months. 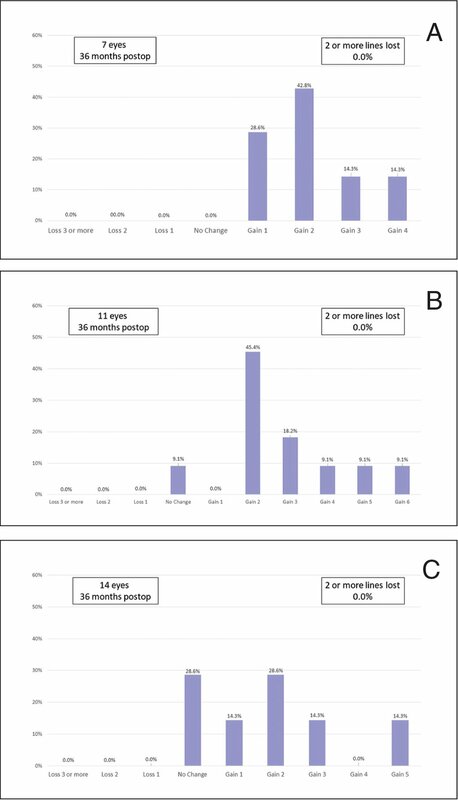 Corneal tomography, corneal aberration examinations, and endothelial counting were performed at 6 months. Figure 2 demonstrates the long-term postoperative results in one patient. The sutures were removed no earlier than 12 months postoperatively, based on the appearance of their tension on slit-lamp and topography readings. 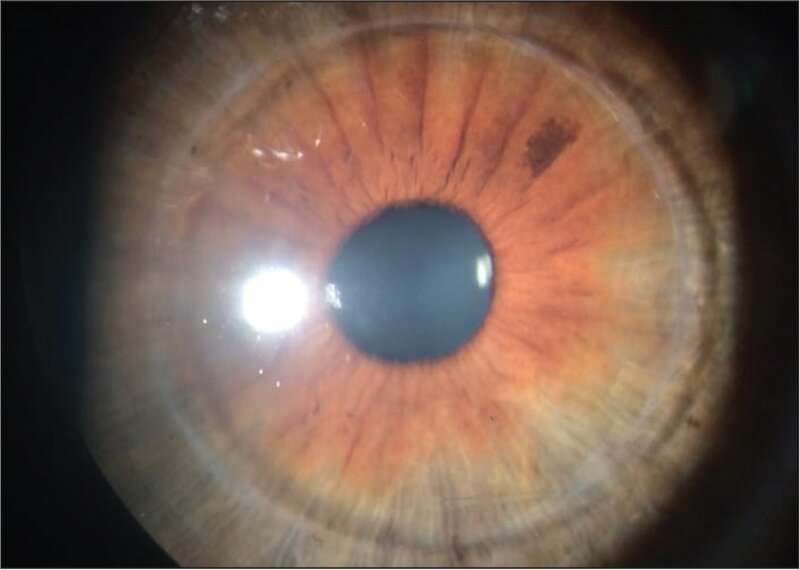 Long-term results of slit-lamp examination without sutures. The improvement of CDVA, sphere and cylinder refraction, and higher order aberrations (HOAs) were the main outcome measures. Data were collected at 1 day (n = 69) and 3 (n = 69), 6 (n = 69), 12 (n = 69), 24 (n = 51) and 36 (n = 32) months postoperatively and analyzed in a database using Microsoft Excel 2015 software (Microsoft Corporation, Redmond, WA). Data were analyzed according to the arc length: 180°, 270°, and 360°. Preoperative and postoperative data at 36 months of follow-up were compared using the Student's paired t test. Outcomes measured were analyzed for final results. Data were expressed as mean ± two standard deviations. A P value of less than .05 was considered to be statistically significant. The age of the population was 30.83 ± 12.65 years (range: 16 to 48 years). There were 151 men and 18 women. The mean follow-up time was 29.81 ± 6.22 months (range: 12 to 36 months). 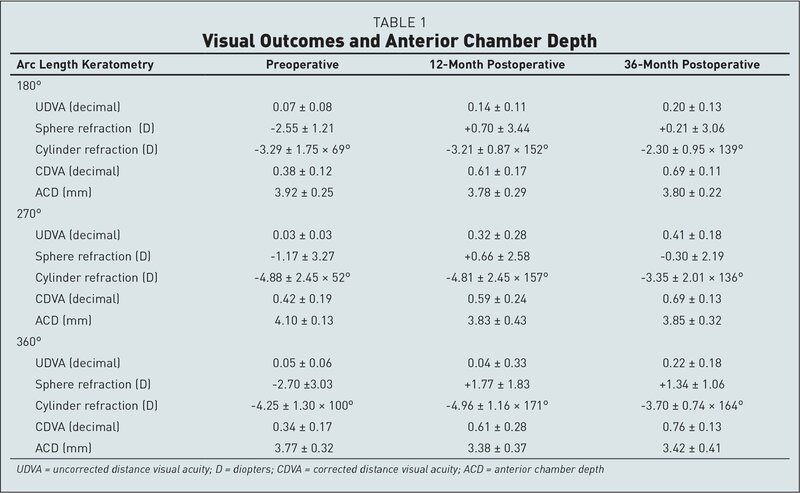 Table 1 shows preoperative and 12- and 36-month postoperative UDVA, CDVA, sphere and cylinder refraction, and anterior chamber depth for 180°, 270°, and 360° arc lengths, respectively. UDVA and CDVA showed an improvement between 12 and 36 months postoperatively. Sphere refraction presented more hyperopic values at 12 months than at 36 months. Cylinder refraction showed higher values at 12 months than at 36 months. Most of the compared parameters were moderately to statistically significant (P < .05 to < .0000001). At 36 months postoperatively, 57.2% presented with UDVA of 20/100 or worse and 42.8% achieved between 20/80 and 20/40. After performing photorefractive keratectomy (PRK) in 3 cases, 14.3% presented with UDVA of 20/100 or worse, 57.2% achieved between 20/80 and 20/40, and 28.5% achieved 20/30 or better with an arc length of 180° and 45.4% presented with UDVA of 20/100 or better, 45.4% achieved between 20/80 and 20/40, and 9.2% achieved 20/30 or better with an arc length of 270°. After performing PRK in 4 cases, 9.2% of the cases presented with UDVA of 20/100 or worse, 45.4% achieved between 20/80 and 20/40, and 45.4% achieved 20/30 or better. For an arc length of 360°, 64.3% presented with UDVA of 20/100 or worse and 35.7% achieved between 20/80 and 20/40. After performing PRK in 7 eyes, 28.5% of the cases presented with UDVA of 20/100 or worse, 57.2% achieved between 20/80 and 20/40 and 14.3% achieved 20/30 or better. Table 2 shows preoperative and postoperative HOAs for 180°, 270°, and 360° arc lengths; HOAs decreased 14% and coma decreased 17%. Figure 3 shows the pre-operative and postoperative corneal tomography in a representative case. Preoperative and postoperative corneal tomography in a representative case. (A) Corneal tomography of the right eye of an 18-year-old man with refraction of −5.00 diopters (D) cylinder at 35°. UDVA was 20/100 and CDVA was 20/50. The flattest meridian was 46.25 D at 22° and the steepest meridian was 51.50 D at 112°. The corneal remodeling technique assisted by femtosecond laser was planned using a 270° keratectomy, with a gap of 500 µm. Eighteen months after surgery, the refraction in the right eye was +2.50 −1.00 × 175°. UDVA was 20/50 and CDVA reached 20/20; the flattest meridian was 40.00 D at 0° and the steepest was 45.00 D at 90°. (B) Postoperative corneal tomography map. Figure 4 shows the distribution of gained and lost lines of CDVA at 36 months postoperatively. For a 180° arc length, almost 70% of the cases were stable or gained up to two lines of visual acuity. For a 270° arc length, 65% of the cases were stable or gained two or three lines of visual acuity; almost 30% of patients gained four to six lines of visual acuity. For a 360° arc length, 85% of the cases were stable or gained up to three lines of visual acuity; 15% gained five lines of visual acuity. None of the patients lost lines of visual acuity. Regarding intraoperative or postoperative complications, we had to adjust some sutures or place additional sutures in 8 of 69 cases. These adjustments were made for a better distribution of force vectors during the first postoperative days. No patient presented with mild, moderate, or severe signs of infection or inflammation during the immediate postoperative period. Poor visual acuity and high corneal aberrations are due to the irregular astigmatism generated by the above-mentioned changes rather than to thinning per se of the cornea. In other words, thin corneas do not cause poor visual acuities: topographic asymmetries of keratoconus generate the visual decrease. Because intracorneal rings must increase the corneal thickness to generate the topographic changes in the cornea, corneal remodeling can produce those changes in a more predictable way and generates an optical zone larger than the one used for intracorneal rings.21,22 Taking into account such unpredictability, the corneal segments are used as an orthopedic treatment in ectasia. However, they induce high corneal aberrations due to their position in the usual useful optical zone, which inevitably affects the visual quality of patients.22 The area in which corneal segments are implanted is so narrow that it does not leave a real refractive optical zone. The progression of keratoconus is accompanied by an increase in the anterior chamber depth and posterior corneal curvature, corneal thinning, and progressive corneal curvature. A decrease of the anterior chamber depth (an average of 400 µm) is observed and also represents a refractive impact. The corneal remodeling procedure can literally remodel the profile of the cornea. The first cases were followed up for 48 months, but we have shown analyzed data over 36 months due to the smaller sample size obtained at that time. In all cases, we observed corneal flattening, which is an increase in the radius of corneal curvature. None of the cases presented loss of visual acuity lines and most of them gained up to three lines of CDVA. Likewise, without being the main objective of this procedure, the UDVA in many cases was better than 20/40. This reflects the predictability and safety of the procedure. To date, treating corneal deformation cases with keratoconus has been either a palliative or barely compensatory procedure. We believe corneal remodeling represents a new and effective approach to treat corneal ectasia, but a longer follow-up will be necessary. Even with a certain degree of astigmatism after the procedure, changes in keratometric values allow us to recover a physiological corneal profile. Furthermore, it allows surgeons to be able to perform complementary refractive corrections to achieve an integral treatment of the ectasia. Ambrosio R Jr, Klyce SD, Wilson SE. Corneal topographic and pachymetric screening of keratorefractive patients. J Refract Surg. 2003;19:24–29. Barbero S, Marcos S, Merayo-Lloves J, Moreno-Barriuso E. Validation of the estimation of corneal aberrations from videokeratography in keratoconus. J Refract Surg. 2002;18:263–270. Mortensen J, Ohrström A. Excimer laser photorefractive keratectomy for treatment of keratoconus. J Refract Corneal Surg. 1994;10:368–372. Lugo M, Donnenfeld ED, Arentsen JJ. 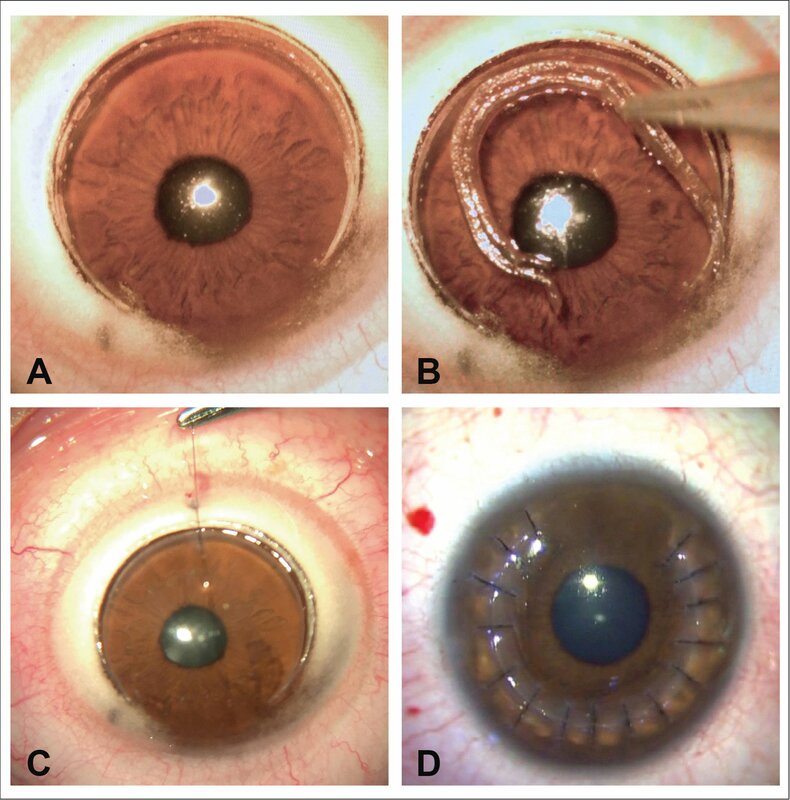 Corneal wedge resection for high astigmatism following penetrating keratoplasty. Ophthalmic Surg. 1987;18:650–653. Durand L, Chahid B. Primary wedge resection of the cornea for keratoconus deformity [article in French]. J Fr Ophtalmol. 1993;16:626–627. Carriazo C, Cosentino MJ. Corneal remodeling to treat keratoconus. Presented at the European Society of Cataract and Refractive Surgery annual meeting. ; October 2017. ; Lisbon, Portugal. .
From Clínica Carriazo and Universidad Del Norte, Barranquilla, Colombia (CC); and Instituto de la Visión and Universidad de Buenos Aires, Buenos Aires, Argentina (MJC). The authors have patents pending in the United States (US2017/0056246 A1) and Europe (EP 3 135261 A1).